Julie Gehrki, (right) senior director of the Walmart Foundation, presents a check for $750,000 to members of the Northwest Arkansas Community Internal Medicine Residency Program, a partnership of the University of Arkansas for Medical Sciences (UAMS), Mercy Health System Northwest Arkansas in Rogers and the Veterans Health Care System of the Ozarks. Shown with Gehrki are Bryan C. Matthews, the VA medical center director, Steve Goss, M.D., president of Mercy Clinic Northwest Arkansas, and program Director Thomas K. Schulz, M.D., from UAMS. 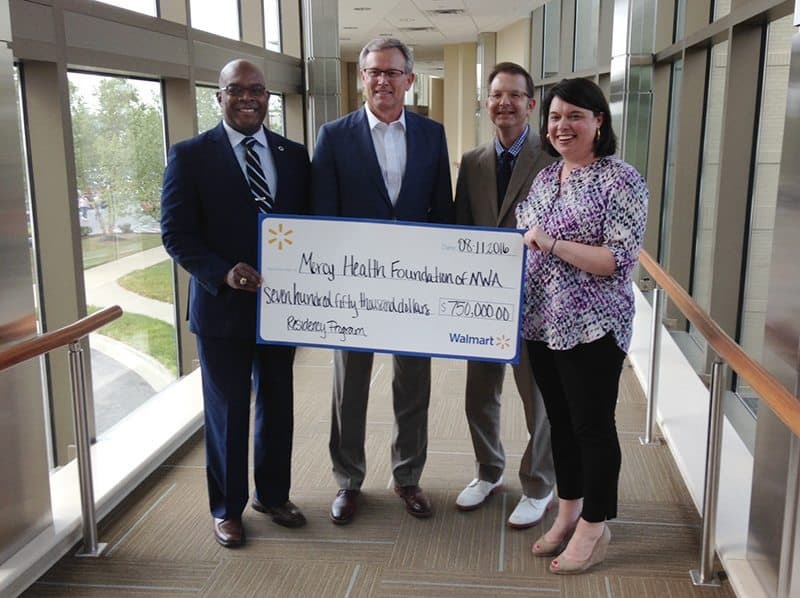 Aug. 11, 2016 | LITTLE ROCK— The Walmart Foundation has given $750,000 to support the Northwest Arkansas Community Internal Medicine Residency Program, a partnership of the University of Arkansas for Medical Sciences (UAMS), Mercy Health System Northwest Arkansas in Rogers and the Veterans Health Care System of the Ozarks. The Northwest Arkansas Community Internal Medicine Residency Program admitted eight resident physicians for its first year. Shown with program Director Thomas Schulz, M.D. (second from left), they are (from left) Chris Finlay, M.D. ; Mark Shelnutt, M.D. ; Michelle Valentine, M.D. ; Naveen Kallarackal, M.D. ; Nhanmy Huynh, M.D. ; Kristopher G. Stepps, M.D. ; Sonia Chaudhary, M.D. ; and Matthew Neoh, M.D. The first eight resident physicians started June 30 for the program that is based at UAMS’ northwest Arkansas campus in Fayetteville. Five of the physicians are serving their residencies at Mercy Health System Northwest Arkansas in Rogers, while the other three are at the Veterans Health Care System of the Ozarks in Fayetteville. 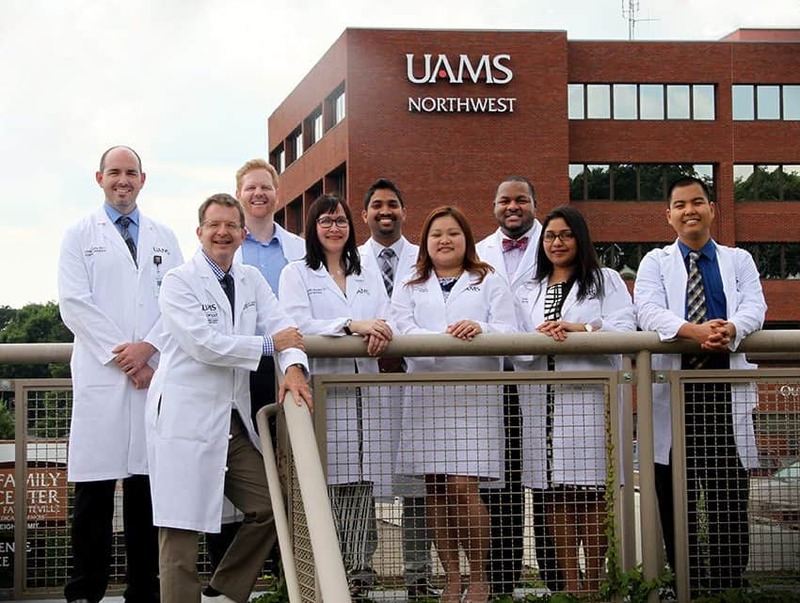 All eight residents will practice at both locations as well as the Residency Continuity Clinic on UAMS’ northwest Arkansas campus. The program is expected to grow over the next two years until there are 24 residents by 2018. The Walmart Foundation’s grant will go toward covering the residency program’s first two years of operating costs, including residents’ salaries. “We are thrilled to partner with the Walmart Foundation to bring more talented physicians to train — and, hopefully, stay — in northwest Arkansas,” said program Director Thomas K. Schulz, M.D., an associate professor in the UAMS College of Medicine’s Department of Internal Medicine. The program received accreditation in September 2015 from the Accreditation Council for Graduate Medical Education. Residents are trained in a variety of internal medicine subspecialties including critical care medicine, cardiology, emergency medicine, geriatric medicine, gastroenterology, oncology and pulmonary disease. Michelle Valentine, M.D., Rocky Vista University College of Osteopathic Medicine in Parker, Colo. The residency program is important to the region’s effort to address its doctor shortage, especially with regard to primary care doctors who treat adults and the elderly, said Steve Goss, M.D., president of Mercy Clinic Northwest Arkansas. The number of students graduating from schools of medicine and osteopathy is growing, but the number of residencies lags behind, he said. Mercy wants to do its part to help educate the next generation of doctors by giving them this intensive clinical experience. Mercy also wants to be part of building northwest Arkansas as a destination for great health care, and the residency program is part of that, Goss said. “We believe if we train them here, many of them will stay here. It’s another way to attract great physicians,” Goss said. Mercy Northwest Arkansas is a health care destination with more than 203 integrated primary care and multi-specialty providers working from a 208-bed, state-of-the-art hospital completed in 2008 and 30 clinics through the region. After investing $400 million in the community over the past 20 years, Mercy Northwest Arkansas plans a $247 million expansion that will add a seven-story, 100-bed tower to the hospital and seven new clinics. The expansion will add 1,000 co-workers, including 100 physicians, to Mercy Northwest Arkansas’ existing workforce of 2,000. The Veterans Health Care System of the Ozarks (VHSO) consists of one Veterans Health Administration (VHA) facility located in Fayetteville, Arkansas. VHSO has Community-Based Outpatient Clinics (CBOCs) in Fort Smith, Harrison and Ozark, Arkansas; Branson and Mount Vernon, Missouri; and Jay, Oklahoma. VHSO is a 63-bed facility providing various inpatient, outpatient specialty care, and primary care services. VHSO is a Robert W. Carey Award Circle of Excellence Winner (2013), as well as the 2013 recipient of the Arkansas Governor’s Quality Award.